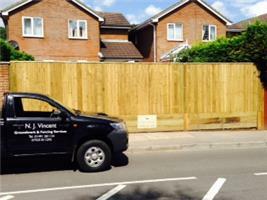 N J Vincent Groundwork & Fencing Services - Fencing/Gates based in Sonning Common, Berkshire. Invoice history based on 130 reviews. Having been in this industry for over 20 years, I specialise in all domestic, agricultural and equestrian fencing. My qualifications and experience as a plant machine operator also enable me to carry out ground works to a very high standard. I'm a licensed waste carrier with full public liability insurance to give you the peace of mind that all waste is removed and recycled in an environmentally friendly manner. For the full list of the types of works I provide please visit my 'Services' page.